When we think of the Maori, most of us instantly have the “Haka” in mind, a group of bare chested, stomping, chest thumping, chanting and quite intimidating men covered in Ta Moko (Maori tattoo). So when I decided to visit New Zealand I instantly thought that this would be a great opportunity for some amazing photos. I started researching Maori culture and found out that the Maori have quite an extensive history as fierce warriors. There is quite a bit on that online but trying to find someone who instructs any of the arts that were talked about was quite a task! The problem was that I was googling “Maori martial arts” or “Maori warriors” … What I should have googled was for example “Mita Mohi´s Te Arawa Style Mau Taiaha” . Yeah… go figure. Somehow I managed to put the pieces together and looked for Mau Rakau which means something along the lines of Stick fight. And through that I found Jade Morgan on facebook who turned out to be extremely helpful, and very enthusiastic even if shy about me wanting to do a Warriors Shoot with him. At some point I had to change the dates of my trip due to another job (which in the end did not happen at all!) and that was great luck as Jade told me I would be in Christchurch right in time for their annual Easter Wananga which is a Warrior Camp for young men and boys. 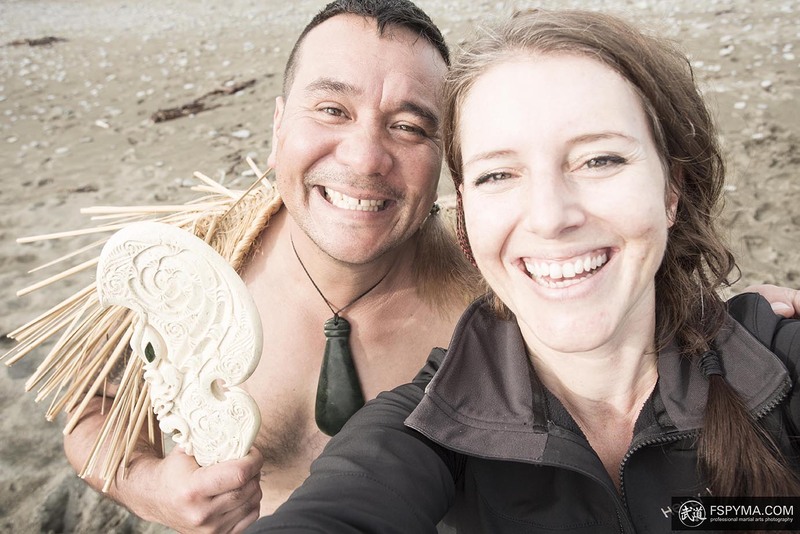 So that got me to spend four days in the middle of Maori culture, language and martial arts (you can read all about it in my MODERN MAORI WARRIORS blogposts). On the morning of the third day at camp, Jade and I took off to get this Warrior Shoot done. He was quite nervous but I said he had nothing to worry about. And besides, he was the first real warrior I was photographing too! Jade often performs traditional Maori welcoming ceremonies. If you ever get to watch an authentic and official one, you do get goosebumps. Anyway. Just near the camp was this most amazing beach with mountains far away in the backdrop. Jade had told me lots about Maori Culture so I knew about Tangaroa, the lord of the Sea and Tane Mahuta, the protector of the forest (needless to say I’m fascinated by Maori lore!). He also mentioned something about the mountain being the father and the river being the mother. So I thought the beach/mountain backdrop would be perfect. When we got to the beach we stumbled upon this massive log that was just absolutely perfect! Since I was travelling I had only brought my Canon flash and a tripod that I mounted it on. But once again the weather was perfect so all I needed was a bit of fill light. I used my 20mm and 50mm fixed lenses as i wanted this shot to have a feeling of space rather than being too compact. We went through a series of “poses” and Jade ended up having a lot of fun. This whole trip to New Zealand was very important to me as it was something I had been wanting to do for so long, but somehow I had never gotten around to doing it. But I don’t think I’ve ever felt so welcomed, so at home and so at ease in a country that I hadn’t visited before. And a lot of it was thanks to Jade who just took a complete stranger in and not only talked to me about but also let me experience this rich Maori culture. An and by the way, “Mita Mohi´s Te Arawa Style Mau Taiaha” is the name of the style that Jade trains. Mita Mohi is the founder of this style, Te Arawa is the name of his tribe and Mau Taiaha means that it is a style including the Taiaha, which is the beautiful carved spear. 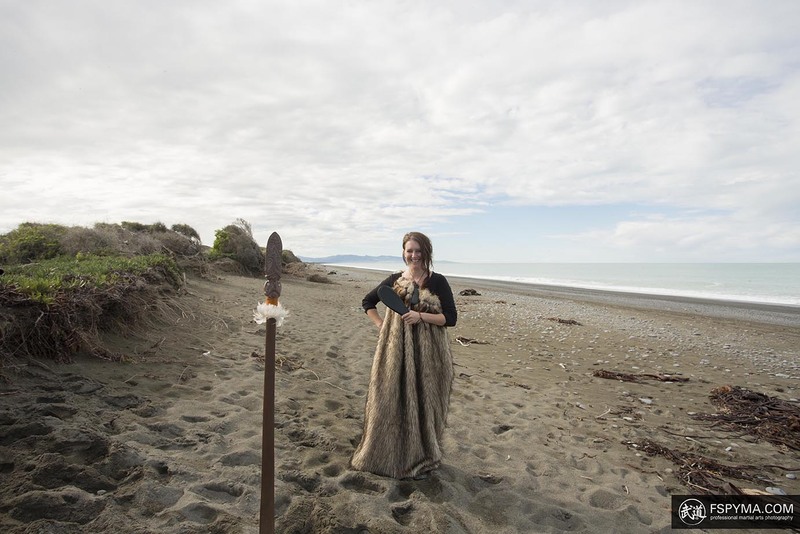 If you want know more about it, have a read through my MODERN MAORI WARRIORS blog post.